Forbes Silver Company. (c. 1894-1900). Crumber. Silver or silver plate. (Cat. ID. no. 2014.15.16. Viewed 26 July 2018. C00147). Washington State Historical Society, Tacoma. Forbes Silver Co. (c. 1894-1901). Flagon. Silver plate. Object ID no. 1993.032.001. Viewed 23 July 2018. E00155-56). Forbes Silver Company. (before 1900). Teapot. Silver plate. (Accession no. 1972.16.3. Viewed 10 July 2018. G02443). Forbes Silver Company / ISC. (c. 1900-10). Cream pitcher. Presumably silver plate. (Object ID no. 2004.118.4.3. Viewed 11 July 2018. G02562-63). Forbes Silver Company / ISC. (c. 1903). Tea service: teapot, butter dish with lid, waste bowl, sugar bowl with lid, and creamer. Accession no. 2010.59.1-.5. Viewed 26 July 2018. C00145-46). Photo - Kansas Historical Society, Topeka. Photo - The Henry Ford, Dearborn, MI. Forbes Silver Company / ISC. (c. 1919). Living cup, trophy. Silver plate. (Cat. no. 2003.072.0020. Viewed 12 July 2018. G02621-22). Photo - Orange County History Center, Orlando, FL. Click the following link to see the parallel webpage - Forbes Silver Company design catalogues and historical documentation. Forbes Silver Company / ISC. (c. 1920). Sugar bowl and lid, and cream pitcher. Silver plate. (Object ID no. 92.259.46.A-.B; 92.259.47. Viewed 26 July 2018. C00161-63). Forbes Silver Company. (c. 1921). Loving cup, trophy. Silver plate. (Object no. 2004.090.0168. Viewed 10 July 2018. G02444-45). Photo - Maine Historical Society, Portland. Forbes Silver Company. (undated). Friar’s Club Cup. Silver, copper. (Accession no. 1982.712. Viewed 12 July 2018. G02632-36). Forbes Silver Company. (undated). Pitcher and cup. Silver plate. (Cat. no. 2004.11.07.jy. Viewed 3 July 2018. G02167-69). Photos - Chautauqua Institition, Chautauqua, New York. Forbes Silver Company. (undated). Condiment holder. Presumably silver plate, glass missing. (Object ID no. 1977.100.216. Viewed 11 July 2018. G02560-61). Forbes Silver Company. (undated). Cruet stand. 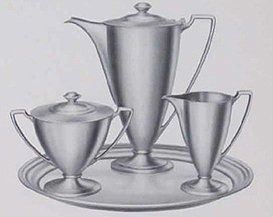 Silver or silver plate. (Cat. no. 2017.0034.003a. Viewed 12 July 2018. G02618-20). Photo - Huron County Museum, Goderich, Ontario, Canada. Forbes Silver Company. (undated). Small spoon. Silver or silver plate. (Cat. no. 2017.0034.034. Viewed 12 July 2018. G02616-17). Forbes Silver Company. (undated). Communion flagon. Silver plate. (Cat. no. 1943.15.2. Viewed 26 August 2018. J00145). Photo - Kentucky Museum, Western Kentucky University, Bowling Green. Forbes Silver Company. (undated). Vase. Accession no. 2016.1.2. Viewed 26 July 2018. C00155). Forbes Silver Company. (undated). Mug. (Accession no. 2002.60.743. Viewed 26 July 2018. C00148). Forbes Silver Company. (undated). Toothpick holder. Silver or silver plate. (Cat. no. 75-9-159. Viewed 9 July 2018. G02433). Forbes Silver Company (undated). Pickle caster. Silver plate. (The holder has this dated at c. 1960; however if by the same Forbes Silver Co., the dating is probably incorrect. Object no. H 89924. Viewed 30 June 2018. A03021). Forbes Silver Company. (undated). Serving tray. Silver plate. (Cat. no. 55-590. Viewed 20 August 2018. L00634). Bonhams Los Angeles - Sunset estate auction (30 AUG 2009). Forbes Silver Co. (undated). Green glass vase, with silver overlay (Forbes Silver Co.). (Viewed 2 July 2018. G02114). Photo - Bonham’s San Francisco - SOMA estate auction (29 JAN 2006). > Forbes Silver Co. flatware in exposition restaurant. 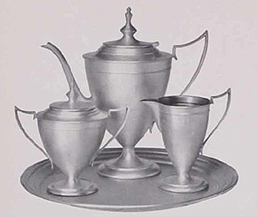 For documentation, see the Design Meriden - Forbes Silver Co. design catalogues and historical information page.